They say that New Year’s resolutions are hard to keep, with up to 80% of them failing by February. We say make a resolution that will keep on working, even long after you forget about it. 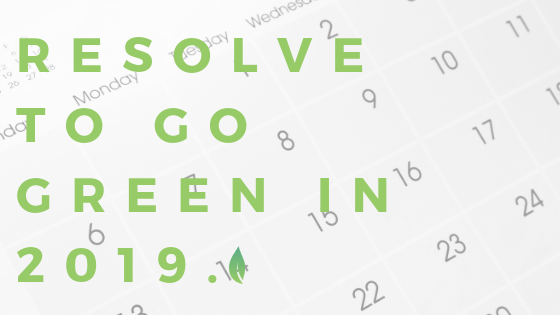 We say make 2019 the year you Go Green. With just some initial work in January, energy efficiency measures and practices will take care of your new resolution until the end of 2019 (and beyond). One of the easiest ways you can “go green” is by making the switch to LED lighting. LEDs not only last longer than incandescent (up to 25 times longer, in fact) but they use as least 75% less energy too. Less energy usage = lower utility bills. Lower utility bills means more money in your pocket. For New Jersey business owners, programs like Direct Install or NJ SmartStart Buildings can help upgrade your interior and exterior lighting. (Learn more on our Services page). Take it Easy on the Gas. Consider carpooling or taking public transportation to work. If that’s not an option, take it easy on the road by avoiding aggressive driving. Aggressive drivers are heavy on the pedal and end up burning a lot of gas, which can lower cars’ fuel efficiency (and the money in your wallet). It may be hard to do on NJ’s highways, but we have faith in you. Washers and dryers consume a lot of energy – especially when you’re using hot water. Consider switching to cold water when washing your clothes. ENERGY STAR® washers and dryers also use an average of 20 to 25% less energy than conventional products. Give Some TLC to Your HVAC. Regularly maintaining your heating, ventilation, and air conditioning systems will ensure that its working properly, extend its lifespan, and in the end, save you a lot of energy (and headaches). Remember, less energy usage = lower utility bills. If your HVAC is on the older side (say 15+ years old) it may be time to upgrade. (For NJ businesses, we can help. Schedule a free assessment today). As we mentioned back in Halloween, energy vampires are everywhere. Be sure to unplug common energy draining culprits around your office or home. It may or may not take 21 days to form energy efficient habits, but we think these 5 easy tips will make your 2019 a green one! ©2019 Donnelly Construction. All Rights Reserved.